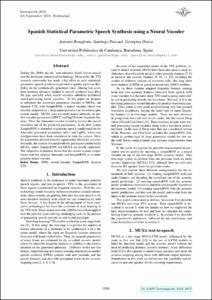 Bonafonte, A., Pascual, S., Dorca, G. Spanish statistical parametric speech synthesis using a neural vocoder. A: Annual Conference of the International Speech Communication Association. "Interspeech 2018: 2-6 September 2018, Hyderabad". Baixas: International Speech Communication Association (ISCA), 2018, p. 1998-2001.